New York does not have the most union workers in the country (that goes to California), but it has the largest percentage of workers that are in unions. By Charles B. Stockdale, Michael B. Sauter, 24/7 Wall St. Overall union membership in the U.S. increased last year -- the first time it did not decline since 2007. The story gets slightly complicated when comparing union membership in the private sector vs. the public sector. In fact, though union jobs increased in the private sector by more than 110,000 in 2011, union jobs in government dropped by nearly 75,000. 24/7 Wall St. looked at union membership by state to identify the states with the highest and lowest membership. 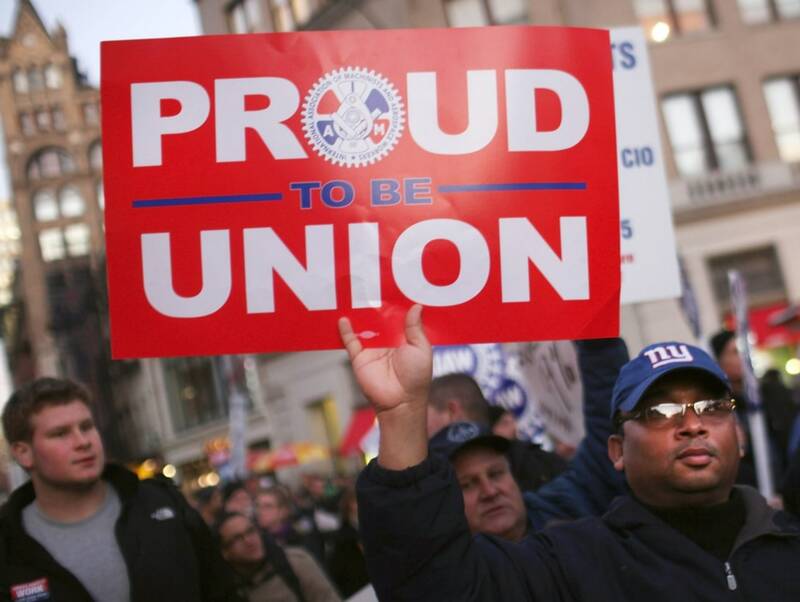 New York has -- for the second year in a row -- the highest rate of union membership among workers at 24.1 percent. North Carolina, also for the second year in a row, has the lowest membership, with just 2.9 percent of all workers also union members. The trend of union membership in the past year is reflected by the national trend in employment. As the general economy has started to recover, the private sector added more than 1.7 million jobs last year. Of that, 112,550 were new union jobs, roughly the same gain as the total increase in private positions. Public sector jobs, on the other hand, have lagged throughout the recovery, as national, state and local governments have continued to enact strict austerity measures. Between 2010 and 2011, the number of government jobs declined by 600,911. Similarly, the number of public sector union members with jobs fell by 72,942. This trend -- an increase in private union membership and a decrease in public union membership -- holds true for many of the states with the largest union membership. In Illinois, which has the third-most union members in the country, private membership increased by 55,487, while public membership fell 27,403. Just as is the case nationally, the source of employment gains in the states with the biggest increases was the private sector. In Texas, for example, total employment increased by 188,142 -- the second-biggest increase in the country. However, the net number does not tell the whole story. The state actually lost 41,942 government jobs as the increase was entirely in the private sector, which added 230,065 jobs. In many cases, states that had been losing union workers in the past decade faster than the rest of the country began to see a recovery last year. Between 2001 and 2011, the state of Michigan lost more than 600,000 union jobs, the equivalent of roughly 20 percent of its total union workforce. Between 2010 and 2011, the state gained back 43,663 union jobs. One potentially damaging trend for unions on a national level is the increasing number of states that have passed “right-to-work” legislation. These laws make it illegal for employers to require workers to join a union or pay union dues. To date, 23 separate states have right-to-work laws, with several others currently considering it. All of the states with the lowest union membership are all right-to-work states, while none of the 10 states with the highest membership do. In order to identify the states with the strongest and weakest unions, 24/7 Wall St. used data calculated by unionstats.com, an online union membership and coverage database. The site, which analyses the Bureau of Labor Statistics' Current Population Survey, provides labor force numbers and union membership in both the private and public sector. 24/7 also reviewed unemployment rates for each state, compiled by the BLS. This is 24/7 Wall St.’s states with the strongest and weakest unions. The number of union workers in Illinois increased by 38,000 from 2010, even as the state’s total labor force fell by nearly 24 percent. The underlying cause of this trend is indicative of what has been going on nationwide. The state lost more than 70,000 government workers between 2010 and 2011, the worst decline in the country, and more than 23,000 of those were union members. Private unions, however, added more than 55,000 members to their ranks in the state, the biggest increase in the nation. And recently, according to the Illinois Statehouse News, Governor Pat Quinn has announced the closure of seven state facilities that employ thousands of public union workers. Connecticut only has the 28th largest working population in the country, but it has the 18th most union members. More than a quarter of a million employees were union members, or 16.8 percent of the state’s working population, up slightly from 16.7 percent in 2010. Connecticut’s strong union representation comes almost entirely from the public sector. Nearly 65 percent of government workers in the state were union members -- the second-highest share in the country, behind only New York. In the past year, unemployment in Oregon has declined at one of the fastest rates in the country, although it remained high. The state added more than 60,000 people to its ranks of employed. Union membership in Oregon rose too, increasing by 24,000 workers between 2010 and 2011. But unlike the nation as a whole, most of these gains were in the public sector. In fact, the number of people covered by private-sector unions actually declined. With 13.9 million private and public sector employees, California has by far the largest workforce in the country. The state also has the most union members in both the private and public sectors. California has just over 1 million private and 1.46 million public union workers. 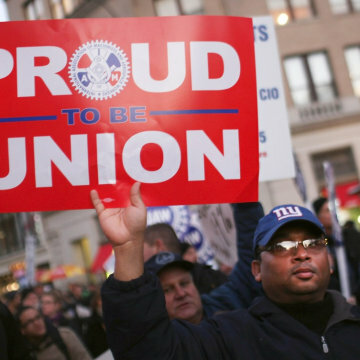 Between 2010 and 2011, the number of union members declined by more than 55,000. The state had an unemployment rate of 11.1 percent in December, the second-highest rate in the country, and a problem that has been affecting the state a while. The number of employed people dropped by 624,000 between 2001 and 2011. Rhode Island has one of the smallest working populations in the country -- just 453,000 workers in total. Representation by Rhode Island workers in unions, however, is quite high. This is especially the case in the public sector. Of the state’s government workers, 62.6 percent were in public unions, the fourth-greatest percentage in the U.S. In the past year, while public sector unions have increased slightly in total membership, the percentage of government workers in unions has dropped. Traditionally, Michigan has had extremely high private union representation, particularly from the auto industry. That sector took a major hit over the past decade. Between 2001 and 2011, the number of private sector employees fell by more than half a million; private union workers declined by 228,000. That trend has started to reverse in the past year. Between 2010 and 2011, the U.S. added 112,550 private union sector jobs, of which 32,000 were in Michigan. However, there is increasing interest among lawmakers to implement a right-to-work law in the state, making it illegal for employers to require their workers to join unions and pay union dues. The number of union workers in Washington has taken a severe dive in the past year, declining by 34,663 -- the third-biggest drop in the country. Almost all of this drop came from public sector unions. The total number of government workers fell by 16,000 in the state over the past year, but the number of public sector workers in government unions fell by more than twice that. Nevertheless, the state still has one of the highest rates of union membership in the country, ranking fourth for percentage of union membership for private workers, with 56.8 percent, and 10th for percentage of union membership for public workers, with 10.7 percent. Nationally, public union members declined between 2010 and 2011, while private membership increased. The exact opposite was true for Hawaii, which had a slight increase in government employees who are union members, while the total number of those in unions declined by several hundred because of a decline in the private sector union jobs. Nevertheless, at 14.1 percent, Hawaii has the highest membership rate for private unions in the country. Alaska has the third-smallest population of employed people in the country, at 305,485, but the second-highest rate of unionized workers, at 22.1 percent, or 67,572 workers. Alaska has 55.4 percent of its public workers unionized, which is the ninth-highest rate in the country. What makes the state second overall in membership is the fact that 11 percent of its private workers are unionized, which is the fifth-highest rate in the country. The state’s oil and natural gas industry is a major part of its economy -- an industry that is highly unionized. New York does not have the most union workers in the country (that goes to California), but it has the largest percentage of workers that are in unions. It also has the largest percentage of its public workforce, and the second-largest percentage of its private workforce, who are in a union. The state has roughly 1.4 million workers in the public sector, of which more than 1 million are union members. The 72 percent membership in public unions is nearly double the national average of 37 percent. The number of union members in New York took a massive hit last year as the state lost 54,300 union workers, more than any state but California. The majority of this decline came from the public sector. Read the states with the weakest unions the 24/7 Wall St. website.